Download Mouse Automation Software Utilities for Mac Version 10.4 Onwards. Use Mouse Automation Utilities on your Tiger (Mac Version 10.4), Leopard (Mac Version 10.5), Snow Leopard (Mac Version 10.6), Lion (Mac Version 10.7), Mountain Lion (Mac Version 10.8) & OS X 10.9 Mavericks. All the Automation Utilities presented are provided on a free to download and try basis. Payment for Software Registration is required only after you have successfully evaluated any of the Automation Utility on your Mac and are fully satisfied with the functionality offered by the Application. You can also find lots of other Mouse and Keyboard Automation Software including Auto Clicker for Windows and also Linux Auto Clicker to Automate your Mouse Clicking Requirements. All the Software Utilities for Windows & Linux have similar GUI interface as for Mac, and are easy to understand and use. 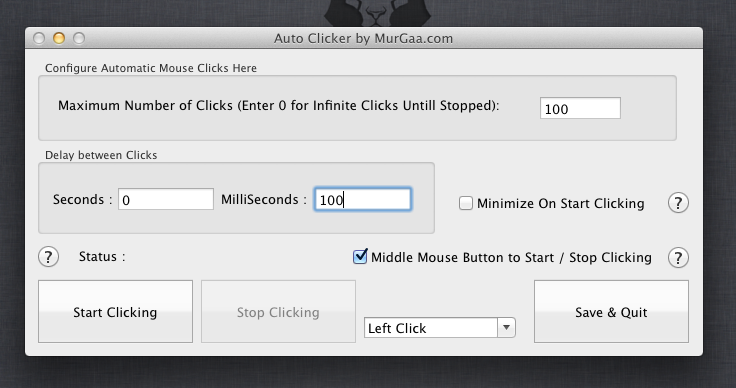 Auto Clicker for Mac is a Mouse Automation Utility which can be used to Click at existing Mouse Cursor Location any number of times. The Auto Clicker is available on a free to try basis. Download and try out the Auto Clicker on your Intel Mac now and give it a try without filling any registration form or struggling with popup reminders or disabled functionalities. The Auto Clicker for Mac is fully functional software utility with a time usage limit. The free trial download of the Auto Clicker works as good as full and registered version of Auto Clicker for Mac. Once the trial usages have been used, the software will ask for registration key. An Auto Clicker for Mac which can be controlled using a Keyboard Shortcut Key is described here. Do have a look at the given below screenshot to get an idea of what all this small Mouse Automation Software Utility for Mac has to offer. Download Mouse Automation Software Utility which can be used to automate fast mouse clicks. The Automatic and Fast Mouse Clicks can be started and stopped using a selectable Keyboard Shortcut Key combination. The delay between simultaneous auto left clicks is controllable using delay within clicks which can be defined in terms of milliseconds. This Fast Clicker for Mac offers a good looking user interface in terms of a small window which can be relocated to any position on the Mac Screen by dragging it with title bar of the window or from any part of the software. This Auto Clicker for Mac is provided on a free to try basis and the software is fully functional in trial mode. This Mouse Automation Utility is a really sophisticated and advanced Mac Automation Utility. This Mac Random Mouse Clicker allows you to automate Left, Right & Middle Mouse Button Clicks. This Mac Automation Utility also allows you to hold any of the mouse buttons as long as you want. Configurable Random and Fixed delay between consecutive mouse actions allows this utility to be used as Random Clicker for Mac and simultaneously as a simple and yet advanced Mouse Clicker for Mac.Video Tutorial demonstrates how to use the Mac Random Mouse Clicker on Mac OS X.
Download Random Clicker Utility on your Mac running on Intel Architecture and try it for free. Have a look at the Screenshot of the Random Clicker taken on a Mac displaying various control and display controls. You can Start / Stop the automatic Mouse Click using buttons provided on the User Interface or you can assign a Keyboard Shortcut key to Start the Mouse Clicking or Stop automatic Mouse Clicking. 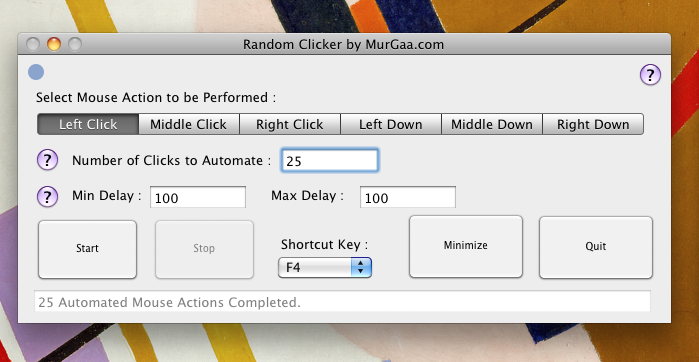 All the parameters of the Mac Random Clicker are stored automatically such as Click Count, Minimum & Maximum delay between automated Clicks & Keyboard Shortcut to Start / Stop the clicks. 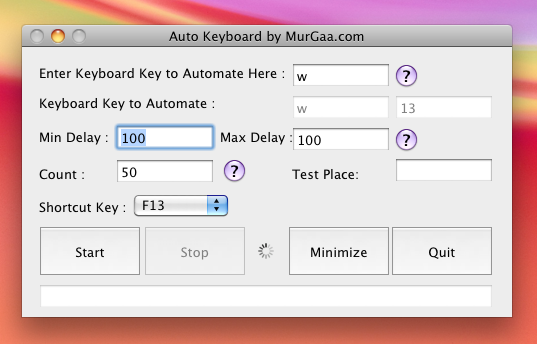 Mac Automation Utility titled Auto Keyboard can be used to automate Keyboard typing on the application with focus. Whether you want to send repetitive keystrokes to an application, game or any other type of document open on Mac, this Auto Keyboard can be really useful. You can use this Mac Automation Utility on Mac running on Intel based Machine. Have a look at given below screenshot to know what all it has in offer for helping you in Mac Automation. Download Mac Auto Keyboard Utility and try it for free on your Mac running Mountain Lion, Lion, Leopard, or Snow Leopard. This Mac Utility is capable of simulating selected keystroke onto active application as many times as you want. There are indicators on the main screen of Mac Auto Keyboard which displays whether currently the utility is sending keystrokes to active application or not. Whether you want to automate displayable keys like a to z or other keys like Enter, Tab, Arrow Keys or any other key on Keyboard, this Mac Auto Keyboard can be your auto typer for sending repetitive keystrokes with configurable or random delay in between. This Keyboard Automation utility allows to configure upto 5 sentences to be typed onto keyboard automatically with selectable keyboard shortcuts. The Automatic typing is initiated automatically when the selected shortcut key is released on the keyboard. Mac Auto Keyboard Utility can be really useful when you have to type in long sentences repeatedly. 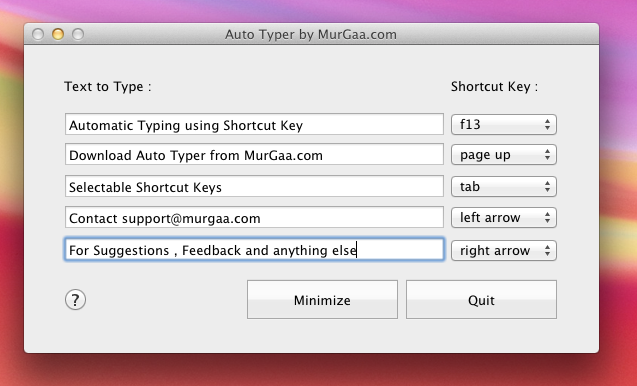 The Video Tutorial displays how you can use Automatic Typing of Mac Auto Typer with configurable Keyboard shortcuts. Download Mac Auto Typer Utility trial for free on Mac OS X running Mac Tiger, Mountain Lion, Lion, Leopard, or Snow Leopard. The Auto Typer can store sentences along with Keyboard Shortcuts automatically and can auto type the stored sentence whenever the selected shortcut key on keyboard is pressed and released. Simple and yet Easy to use Automatic Typing Bot is presented in Mac Auto Talker. Configurable Random Delay in between each character of a sentence and configurable delay between each sentence makes this Automatic Typing Software really useful and configurable. Try this Auto Talker on your Mac running Version 10.5 onwards and save yourself time and efforts for doing repetitive typing of text sentences. Download and try out this Auto Talker on Apple Macintosh Running 10.5 or greater Version. On Macintosh Mountain Lion, you would need to Download the Auto Talker and Launch the Software Installer by using the Open Menu Command of the Right Click Menu. You can also Watch Video Tutorial of the Auto Talker to see how it works and what are the features offered by the software before downloading and installing Auto Talker on your Mac. 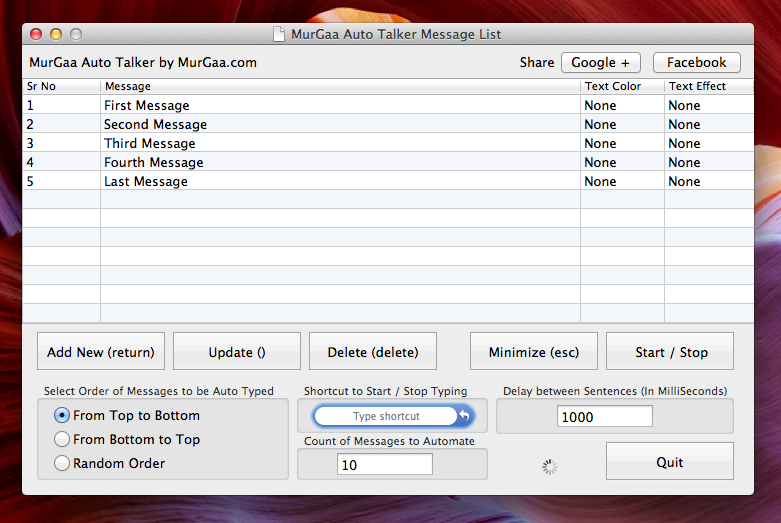 The Auto Talker allows you to configure your own desired Keyboard Shortcut key to Start and Stop Automatic Typing. Pressing the configured shortcut key starts Automatic Typing of Text and pressing the Keyboard Shortcut again, stops the Automatic Typing of Text. You can even configure the Auto Talker to Stop Automatic Typing of Text after a finite number of times. You can Minimize the Main Window of the Auto Talker when using the Software to do Automatic Typing and control it with the configured Keyboard Shortcut. 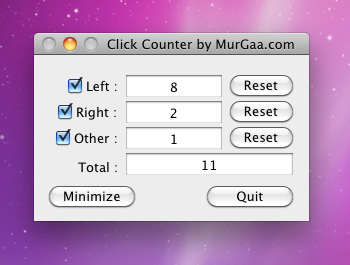 Count Number of Clicks performed on your Mac with Mac Click Counter Utility. The Utility allows to count Left, Right and Middle Mouse Buttons. The Click Counter also displays Total of clicks performed since the Utility was launched. The Utility allows to reset count of individual type of Mouse Clicks with a Reset button. 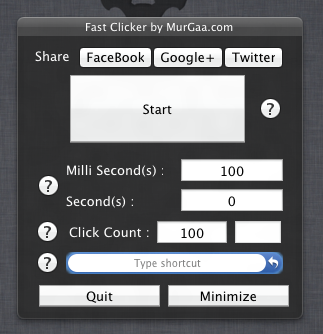 Download Click Counter Utility and try it for free on your Mac running version 10.4 onwards. The Mac Click Counter Utility runs on Intel based 64 bit version of Mac. The Click Counter can count Mouse Clicks on Mac Leopard, Snow Leopard, Mac Lion, Mountain Lion and onwards. 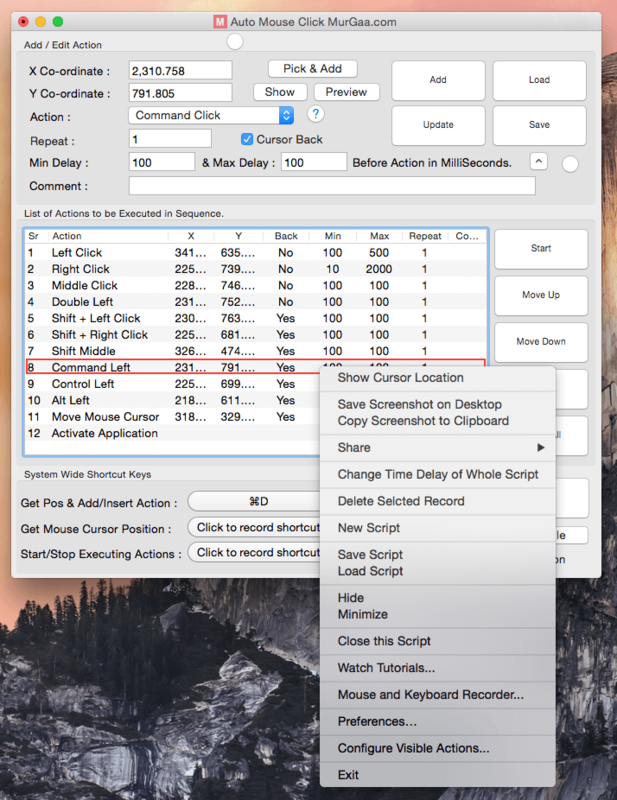 Automate Multiple Mouse Clicks from within a script using Mac Auto Mouse Click. Download this software utility, add some mouse click locations, save the script / macro and run it. This Mac Automation Utility can automate mouse clicks of any type including Left Mouse Click, Right and Middle Mouse Button Clicks as per Mouse Locations stored in the script. This Mac Mouse Automation Utility allows to add multiple fixed screen locations into a script / macro file. With every click added to the script, you can specify delay in the click, a comment to remember about that particular mouse click, specify whether to move the mouse cursor back to original position or not. On a Mouse Script level you can configure the number of times the mouse script should automate the stored mouse actions. This Mouse Automation utility provides two configurable keyboard shortcuts. Once shortcut can be used to pickup screen co-ordinates of target position where you want the script to click. The other keyboard shortcut allows you to start / stop mouse automation by this Mac Auto Mouse Click utility. Do have a look at the screenshot to understand what all this software has in store for you. You can also download Macro Recorder Mac to record Mouse Clicks, Mouse Movements, Mouse Dragging and other Mouse Actions along with Keystrokes being pressed while Recording. The Recorded Macro can be executed with the help of a System Wide Keyboard Shortcut. The Macro Recorder for Macintosh is really easy to understand and use with really simple graphical user interface. Frequently Asked Questions about MurGaa Mouse Automation Software Utilities. In case your question is not answered on this website, please do feel free to contact us by writing at support@murgaa.com.